Over 40 years ago, Newall introduced their state of the art Spherosyn linear scale technology to the machine tool industry. Fast forward to today, over 300,000 Spherosyn and Microsyn linear encoders have been installed. 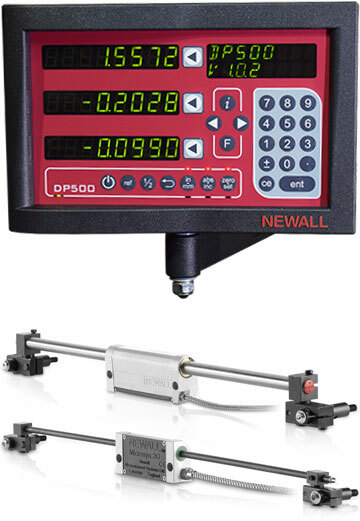 Newall linear scales, paired with their market leading DRO Systems, make up the most advanced digital readout solution in the industry, that maximizes productivity and machine efficiency. 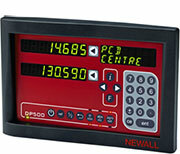 No competitor DRO System can match the durability and reliability of a Newall Digital Readout. All Newall Inductive Linear Encoders feature a truly unique design that addresses all the shortcomings of a traditional glass scale system. By keeping their electrical components covered and protected, Newall linear encoders carry an industry best, IP67 environmental rating, which means they can be fully submersed in water, oil, or coolant, and still provide consistent and accurate readings time and time again. Newall Digital Readouts and Linear Encoders can be purchased separately or in package configurations. Packages are available for milling, turning, and grinding applications. The largest milling package offered is 16" x 40" and the largest lathe package is 22" x 240". For machines with longer axes travels, you can quickly build your own digital readout kit through our website. Learn how to build your own DRO Kit. 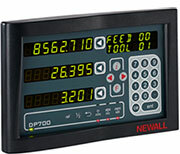 The DP500 is the newest addition to the Newall DRO family. It is a great low-cost solution for knee mills and tool room lathes. This particular DRO system is only offered in package configuration, so be mindful of the travel limitations. The DP500 Package comes with everything you need for complete installation on your machine, including: DP500 DRO Display (2 or 3 axis), Spherosyn LT and/or Microsyn LT Encoder Assemblies with 3.5 armored cable, scale bracket kit and hardware, reader head mounting bracket and hardware, and display mounting arm and hardware. The DRO itself is almost identical to the DP700, but offers a few less features. The DP500 is a great choice for someone looking for a high quality, but low-cost DRO system. The DP700 comes in kits for milling, turning, and grinding applications. At a slightly higher price point than the DP500, the DP700 digital readout offers a wide range of features that are typically only offered on more expensive DRO units. It is available in 1,2, or 3 axes and comes with an industry best 5-Year Standard/ 3-Year No-Fault Factory Warranty. If you're looking for a high-end DRO system that has a proven track record of accuracy and durability - the DP700 DRO will fit the bill. Complete with a larger color display, the DP1200 was built with large travel machine tools in mind. It has all the features needed to boost productivity on your boring mill, VTL, or long-travel lathe. The unit is available in 2, 3, or 4-axis (including rotary / angular). For lathe applications headstock and carriage mounts are available. A Digital Sending Unit (DSU) is another great option offered to simplify cable routing for long travel machines. 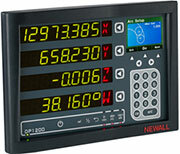 Newall linear scales up to 510" can be purchased online. If your application requires longer travel length, please contact us for pricing. Like the DP700, the DP1200 also comes with an industry best 5-Year Standard/ 3-Year No-Fault Factory Warranty.